As the title states, we are moving to Barbados this July from Tampa Fl! My wife is a Foreign Service Officer(diplomat) with the US Department of State, yesterday we were told our first posting would be the US Embassy, Bridgetown Barbados. To say the least, were thrilled! I plan to document the move as we go through this much like the other great expat threads that have been on dockside chat over the years. We have a ton to do before we will be ready to move and I'll have tons of questions for the peanut gallery as I'm sure there will be plenty of people with experience here that we can draw from. I work for a software company based in Tampa, and already work from home most of the time, I have quite a bit of equity built up with my company and will have no problem keeping my current job while living in Barbados, I'll likely be flying back and forth to Tampa once a month for meetings. The flights are very reasonable. The state depart will provide us fully furnished housing, research shows mostly 4/3's - 3/3's with a pool, fenced yard, near the beach. Education, DOS will pay for our 7 year old son to go to one of the international private schools in the capital. My sister is helping us research our options. The timing works out nicely for this as my son will be able to get acclimated over the summer and start second grade in the fall. Vehicles: The DOS will ship one vehicle to your posting on their dime, but In Barbados, they drive on the left side of the road and use right side drive cars. You can bring left side drive vehicles but there is an insurance surcharge. As of right now, were planning to sell our 2 cars and truck, and purchase an SUV there. As a diplomat were not subject to the Bajan duty and taxes which are very high, because of this many DOS employees buy a car there duty free and then sell it to a local or back to the dealer for what they paid for it when they leave. I need to make the final call in the next two weeks so I can start selling cars here and line up a purchase of a car there over the internet so it's waiting for us when we arrive. Leaning towards a Toyota Hilux 3.0 diesel. Anyone have thoughts on input on this? The single biggest challenge we will face is getting our house on South Tampa Bay ready to rent, it needs a bunch random stuff done in a very short amount of time. Painting, screen work, concrete work, windows/doors replaced, plumbing work etc. This will be my second fulltime job over next 2 months. After it’s ready to go were going to use a full-service rental management company, I’m sure many of you have experience with rentals and will be able to lend advice as I go through this process. Now the fun stuff! Barbados is really a dream destination for us, we had it listed very high on our bid list along with Panama, Costa Rica, and Dominican Republic. As a family, we love to boat, fish, dive, snorkel, surf, kayak and generally do anything outside or in the water. In anticipation of the move, I already sold my flats boat, the big boat is staying in Sarasota with the rest of the crew and partners. Although it's not as high in priority as most of the above, I will be fishing a lot and am researching and considering my boat options. We will only be at the post for 2 years, so it may not be the best option to buy a boat there. So far here are the options I have thought of. 1. Buy a boat when we get to post, sell it when we leave. I have no idea what the used market looks like there, my experience is that the market on most islands is inflated and it’s hard to find anything not completely beat up. 2. Hook up with a good charter guy and become a regular, maybe work a deal out if you are going twice a month and don’t require the full service of rigging baits and what not. 3. Find someone to rent a boat from regularly, I think this would be my preferred choice, not sure how realistic it is. 4. Find someone state side who wants to park their boat in Barbados, I’ll pay for the slip, Any Takers? completely unrealistic, but figured I would ask. That’s it for now, still in shock but will be posting much more as we go through this process. I’m sure some of you have been there before? What were your thoughts? Any advice? Subscribed...what a great opportunity for your family! 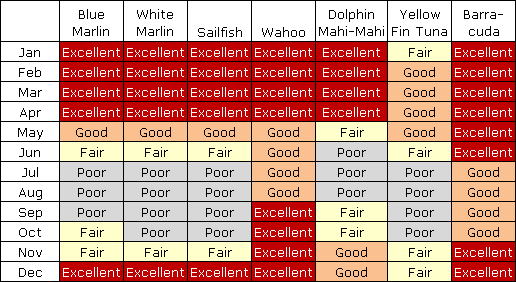 From the looks of your chart you will be eating a lot of wahoo. Not a bad thing. You have a good handle on the move already. Buying a vehicle on island is the right move. We drive on the left here also. Used boats are expensive but they do keep their value on island. Might take awhile to adjust to the slower pace of life. Took me a couple of years. Private school is the way to go. One of my employees is from Barbados if you have any questions just PM me. I've been to Barbados many times. Love it there. Good luck and enjoy your time there ! the toyo hilux is popular in the islands. it will be an easy re-sale. congrats on your new move. PM Flying Bajan, member here, and a wealth of info about the island - he seems to know everyone! Went for a week in December. Nice place, but happy where we are! Send me a pm with any questions you have. I have lived here in Barbados for 4.5 yrs and am moving back to Canada in July. I also have a boat here that may still be available for sale. There is a large US Embassy contingent here and I can put you in contact with a few that can also provide good advice. Good stuff, what kind of boat do you have? Also do you know any boat sale sites there or online swap shops or Craigslist type sites? We have a sponser from the Embassy so we should be all set on that front. I visited there back in the 80's while in college. I have fond memories of riding South Point every morning and catching a north swell breaking at a place called Batt's Rock over on the west coast. Takes a little bit of getting used to driving on the opposite side of the road but you will figure it out quick! Following your dreams and living your life, you are very smart. Lol. did six months in the early 90s there. If the op doesn't know how to surf or dive there isn't a better place to learn. Love the locals there, Best of luck SRQ. Vacationed there last year. Nothing to offer other than extremely jealous. Great island, beaches, friendly people and you'll get used to driving the other way....rented a car while I was there and got used to the left side thing pretty quick. Do be careful with that left side driving. I lived in Barbados in 1978. For me it was the best of times and the worst of times. Once in Barbados I forgot and drove on the right side of the road, thankfully nothing happened. When I got back to the States I forgot once and drove on the left side. Thankfully also then nothing happened. It certainly was a memorable experience. I was a little negative in those days and tended to look for the cloud in every silver lining. In subsequent years "The Power of Positive Thinking" and many other positive thoughts and attitude changes have helped my life improve greatly. I was doing mission work on the island so I didn't have money for boats, fishing, decent car, other entertainment. If you are into boating it certainly would open up a lot of entertainment. The wife and I enjoy getting in the car and driving from Florida to various southern states. I sure enjoyed getting back to the states where we could get in the car and drive a distance. Flying Bajan is the man to speak to about everything to do with Barbados. My boat is a Grady White 275 Freedom with lots of extras including marsh tacky carbon outriggers, grand slam taco 380 bases, tuna tubes, wetsounds speakers, subwoofer and amp and an extra flip out bench behind the captain's chair. Flying Bajan and I have killed lots of fish on the boat. 2 private schools that most expats go to: Providence - Eugene Melynyk's school, very nice property and more of the wealthy locals send their kids there...we didn't have a great initial experience with them and sent our kids to Codrington which is an IB school. It is out on the east coast, so a long bus ride, the school is pretty old and they have a high turnover of teachers. However, the community is great and mostly expats all going through a similar experience to yours, so a very welcoming group of families. I don't think anyone rents boats here. You can try BOYSS to see if they know of anyone selling a boat that would suit your needs.